Edited by Frances Morris, Tiffany Bell. Text by Marion Ackermann, Rachel Barker, Jacquelynn Baas, Tiffany Bell, Christina Bryan Rosenberger, Briony Fer, Lena Fritsch, Anna Lovatt, Frances Morris, Maria Müller-Schareck, Richard Tobin, Rosemarie Trockel. Edited with text by Philip Larratt-Smith, Frances Morris. Edited by Frances Morris. Text by Jo Applin, Juliet Mitchell, Mignon Nixon, Midori Yamamura. 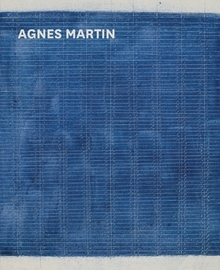 Edited by the exhibitions's co-curators Frances Morris and Tiffany Bell, and with essays by leading scholars that give a context for Martin's work—her life, relationship with other artists, the influence of South-Asian philosophy—alongside focused shorter pieces on particular paintings, this beautifully designed volume is the definitive publication on her oeuvre. Frances Morris places Martin's work in the art historical context of the time; art historian Richard Tobin analyzes Martin’s painting "The Islands"; conservator Rachel Barker offers the reader a close viewing of "Morning"; curator Lena Fritsch provides a visual biography by comparing photographic portraits of Martin from different periods; and art historian Jacquelynn Baas delves into the spiritual and philosophical beliefs so present in Martin's art, including Platonism, Christian mysticism, Zen Buddhism and Taoism. Agnes Martin was born in Maklin, Saskatchewan, Canada, in 1912, and moved to the US in 1932, studying at universities in Oregon, California, New Mexico and New York. She painted still lifes and portraits until the early 1950s, when she developed an abstract biomorphic style influenced by Abstract Expressionism. Her first one-woman exhibition was held at the Betty Parsons Gallery, New York, in 1958. Partly through close friendships with artists such as Ellsworth Kelly and Ad Reinhardt, Martin began to experiment with symmetrical compositions of rectangles or circles within a square, then from around 1960–61 to work with grids of delicate horizontal and vertical lines. She left New York in 1967, shortly after the death of Reinhardt, and moved to New Mexico, where she lived until her death in 2004. Hardcover, 8.25 x 10.5 in. / 272 pgs / 160 color. Published by Fundación Eduardo F. Costantini. 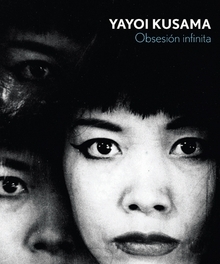 Obsesión Infinita accompanies the first Latin American retrospective of Yayoi Kusama (born 1929), a massive survey of more than 100 works created between 1950 and 2013. It includes her abstract paintings of the 1950s, made just prior to her move to New York in 1957; the "soft sculptures" that followed her move, and her friendships with Donald Judd, Andy Warhol, Claes Oldenburg and Joseph Cornell; and the famous happenings of the late 60s. It was in these years that Kusama became known as "the Polka Dot Princess," for her obsessive use of polka dots in installations and performances. In 1973 she returned to Japan, and in 1977 settled voluntarily in a psychiatric clinic where she has continued to make performances and installations. 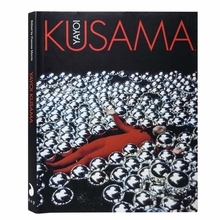 Alongside color reproductions, this volume includes archival photographs of Kusama performances and portraits of the artist from the many periods of her career. Paperback, 9.25 x 10.75 in. / 232 pgs / 94 bw. Accompanying the first major American retrospective exhibition of Yayoi Kusama's work, and an exhibition at Tate Modern in London, this volume offers a definitive monograph on Japan's most famous living artist. It features a wealth of works from all periods in Kusama's career, as well as essays by various international curators and critics, discussing Kusama's years in New York, her career after her return to Japan, her installation works and the psychoanalytic import of her art. Kusama's originality, innovation and sheer drive to make art have propelled her through a career that has spanned six decades, encompassing painting, sculpture, printmaking, photography, collage, film and video, performance, installation and even product design. From the late 1950s to the early 1970s Kusama lived in New York, and was at the forefront of many artistic innovations in the city, becoming close with artists such as Donald Judd, Andy Warhol, Joseph Cornell and Claes Oldenburg, and influencing many others along the way. It was in these years that Kusama was dubbed "the Polka Dot Princess," for her obsessive use of polka dots in installations and happenings. Returning to Japan in her forties, she rebuilt her career, waiting years for the international recognition that she has recently achieved. Now in her ninth decade, Kusama's imagination remains fertile and productive, as she continues to devise dazzling installations and relentlessly hand-paints her ongoing series of minutely detailed figurative fantasy paintings. Yayoi Kusama was born in Matsumoto, Japan, in 1929. She left Japan for New York at the age of 28, following a correspondence with Georgia O'Keeffe, and was soon participating in the city's 1960s wave of happenings and avant-garde activities. In 1973, Kusama returned to Japan and began writing surrealistic novels and poetry. On November 12, 2008, Christie's New York sold a work by her for $5.1 million, a record for a living female artist. Hardcover, 8.75 x 10.75 in. / 208 pgs / 195 color / 51 bw. 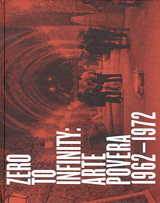 Zero to Infinity: Arte Povera, 1962-1972 focuses on one of the most innovative and influential art movements of the postwar era. Arte Povera came of age in the context of the ''Italian miracle'' economic boom and the subsequent student and workers revolts of 1968, motivated by an urge to revolt not only against the primacy of painting in the postwar period, but also against the emerging consumer culture. This exhibition and its accompanying catalogue provide a highly comprehensive retrospective of the Arte Povera movement as a historical and aesthetic phenomenon that crossed a wide range of disciplines, including sculpture, installation, drawing, photography, film and performance. The exhibition traces Arte Povera's genesis within the artistic and political context of Italy to its positioning within the broader international context of postwar artistic practices, a moment marked by the participation of the Arte Povera group in the 1972 Documenta V exhibition in Kassel. This essential new catalogue is designed by the Walker Art Center's award-winning design department, and includes a wide range of essays by international scholars and curators, as well as rare historical documentation, in an unprecedented re-examination of the Arte Povera movement. Hardcover, 8 x 10 in. / 304 pgs / illustrated throughout.